Senior Citizens population after having lived an active life in their prime years, need personalised care and a life of dignity in their sunset years. When they get affected by age-related disorders, as often happens at advanced age, they need constant medical care, keeping this in mind Vardaan Senior Citizens Home remains equipped to take holistic care of medically-challenged seniors. Professional excellence for Seniors the constant and caring help is the hallmark which the centre strives for. Vardaan Senior Citizens Home is about 7 years old is being managed by Dr. Reicha Khandeiwal, a gynecologist by profession, who has also done a PG course in Geriatrics. 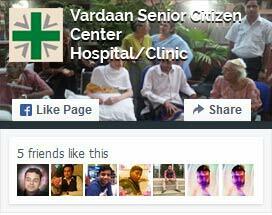 Vandaan Senior Citizens Home is associated with Vardaan Hospital has always been a senior citizen friendly hospital and has been takening special care of senior citizens. It has been actively associated with Helpage India. A Day Care Centre for Senior Citizens set up was in associated with Helpage India was inaugurated here by Smt. Sheila Dixit, Chief Minister, Delhi on March 12, 1999.